The 2012 Presidential Election day is finally here, one day to go. But don’t fret, there is still time to get your students interested in the election! One of the important themes in any election is that of perspective and point of view. Developing the ability to recognize an author’s point of view helps students develop a critical eye in reading texts both historical and contemporary. A good example of a primary source from the Marchand Archive is this poster, “The Whole Story in a Nutshell!” from the 1888 election. It depicts both the Republican platform championed by Benjamin Harrison and the Democratic platform headed by Grover Cleveland. Take a moment to digest each candidate’s platform as presented by this image. Can you discern which party produced this image? What was their motive for producing this campaign ad? How do you know? Asking students these and other questions related to point of view and purpose (detailed in the Common Core Reading Standards for Literacy in History/Social Studies RI6) will help them better analyze primary sources and engage with the political process today. A Republican campaign poster contrasting Harrison’s ideas with Cleveland’s, 1888. This entry was posted in U.S. History and tagged campaigns, Common Core, elections, national politics, voting on November 5, 2012 by jbcosca. A McKinley campaign poster, 1896, depicting the lighter side of our weighty political campaigns. With the 2012 Presidential election only a week away, our voice-mails, in-boxes, and mailboxes overflow with campaign promises. While today candidates can communicate their message over television, the tube was not always an option. What language did politicians in the past use, and does it differ from today? How did politicians across the centuries attempt to sway voters? What imagery did they use to appeal to individuals? What were the issues at stake in a particular election? The Marchand Archives provides a wealth of resources to help answer these important questions. One of my favorite ways to engage with elections of the past is through campaign posters. They provide an excellent opportunity to discuss the political process. Helping students analyze campaign posters from past elections will allow them make sense of the political process they see on television today. To me, campaign posters from the past are similar to TV commercial spots of today. They communicate the message of the candidate in an at-a-glance visual manner. Take for example this 1896 campaign poster for the Republican ticket. Colorful and packed with images, this poster depicts the stance of McKinley and his running mate. While this image also includes a significant amount of text, it is not necessary to read it all. Choice words focus the reader on the candidate’s main slogan: “Our Home Defenders.” What stands out to you from this image? What makes you want to know more about the views of the Republican platform? How does it compare to the Democratic poster of William Jennings Brian from 1900? This entry was posted in U.S. History and tagged campaign posters, campaigns, elections, national politics on October 31, 2012 by jbcosca. BACKGROUND: In 1857 the Supreme Court ruled on the infamous Dred Scott Decision. Chief Justice Roger Taney’s majority opinion claimed that people of color could never be American citizens and that the Missouri Compromise of 1820 and the Compromise of 1850 were both unconstitutional as Congress had no right to interfere with the property of citizens, including slaves. As the ties loosely holding the country together weakened further, Americans began debating the meaning of this momentous decision. The most famous discussion occurred in a series of debates between incumbent Senator Stephen A. Douglas and small-town, lawyer Abraham Lincoln as they toured Illinois running for Senate in the 1858 Congressional election. In these debates Douglas, a long-time advocate of popular sovereignty, argued that the Dred Scott decision still allowed for popular sovereignty. Douglas accused Lincoln of desiring racial equality and allowing marriage between the two races. Lincoln flubbed a response, but eventually proffered a complicated understanding of distinguishing the rights of the races. He believed that all people were created in the image of a supreme being and therefore had the same natural rights. He then explained civil rights, guaranteed by the federal government. Here, Lincoln claimed to believe that black men should have some civil rights, but not all (i.e. citizenship but not the right to vote). Lastly were states’ rights that should be determined by the individual states – pulling directly from constitution. His main example here was the right to marry. If the state of Virginia prohibits the marriage of African-Americans, then the federal government could not interfere. This delineation of rights is what brought Lincoln to the forefront of Republican politics on the eve of the Civil War. Neither man claimed a victory in the debates. Douglas went on to win the Senate seat by a landslide, but this was not a loss for Lincoln as he had become a national figure and was available to run for president in 1860. These discussions created the leader who would take the country into and eventually win the Civil War. How to use this image: When teaching the coming of the Civil War, the connections between the events occurring around the country and the political happenings often seem disconnected. The Lincoln-Douglas Debates provide a great way to connect the events of the 1850s with the rise and eventual victory of Abraham Lincoln. In 1858 a back country lawyer became a well-respected speaker and more firmly established his place as a Republican politician along with his stance against the expansion of slavery. From this discussion, we learn where Lincoln came from (i.e. how a black-horse candidate won the presidency) and why Southerners so immediately seceded upon his election. Luci Petlack is a doctoral candidate in the History Department at the University of California, Davis. Her research interests include black American history, race relations and the American Civil War. Her dissertation, “A Dilemma of Civil Liberties: Blacks under Union Military Control, 1861-1866,” looks at the effects of military occupation and martial law on black communities during the Civil War in Baltimore, Maryland; New Orleans, Louisiana and Cincinnati, Ohio. This entry was posted in U.S. History and tagged civil war, elections, national politics on June 20, 2012 by jbcosca. 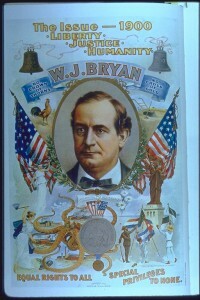 About the image: William Jennings Bryan on a 1900 campaign poster. Symbols of the plow and the rooster; trusts as an octopus’ tentacles over industry. Why does Davis High School Teacher, Kevin Williams, find this image interesting? I find this image usable in several different ways in the classroom. First, it could be used as a warm up for the election of 1900. From the image, students can be lead to identify three central issues: farmers and monetary policy, American foreign policy, and the influence of trusts. The words that appear on this document also provide fodder for discussion. They are loaded and clearly show the biases of Bryan the candidate. I ask students to determine Bryan’s stance on the issues using the images and words. Second, the image is useful as part of an investigation on campaigns. A comparison of this campaign poster and a McKinley poster shows the differences in campaigning techniques between 1900 and today. (A great McKinley poster for comparison can be found here.) You could also ask students to compare this campaign material to the political cartoons published during the election cycle of 1900. The Harp Week website “Presidential Elections 1860-1912,” is a great resource for this. Finally, this would be a marvelous source to bring into any discussion of the Scopes Monkey Trial. William Jennings Bryan is possibly best remembered for his conservative role in the prosecution of John Scopes. I want students to know that Bryan wasn’t simply a reactionary, but was considered somewhat radical and revolutionary at other points in his life. After all, he did promote government ownership of railroads in the election of 1908. This campaign poster could create a more complete picture of a very complex and important historical man. Brett Flehinger, The 1912 Election and the Power of Progressivism: A Brief History with Documents, Boston: Bedford/St. Martin’s, 2003. Ellen F. Fitzpatrick, ed., Muckraking: Three Landmark Articles, Boston: Bedford/St. Martin’s, 1994. Glenda Elizabeth Gilmore, ed., Who Were the Progressives?, Boston: Bedford/St. Martin’s, 2002. The Progressive Era: The Limits of Reform, Social Science Education Consortium, 1989. Share your ideas! How would you use this image? Click here to let us know. This entry was posted in U.S. History and tagged campaigns, elections, gilded age, national politics, progressives, Scopes Monkey Trial, william jennings bryan on January 10, 2012 by jbcosca.